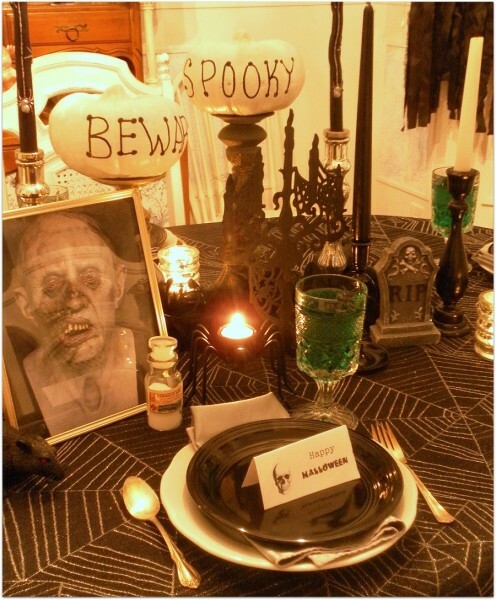 Today I am going to share with you some decorating, and menu ideas for hosting a Halloween dinner party that will impress your guests. 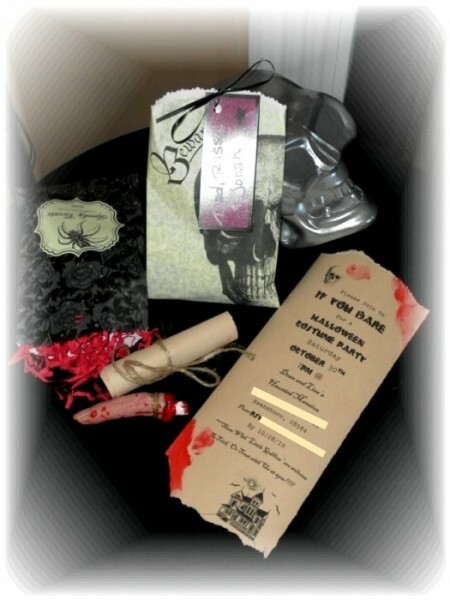 When planning a Halloween gala, the first thing to do is come up with a snazzy invitation. I created this one a few years ago. 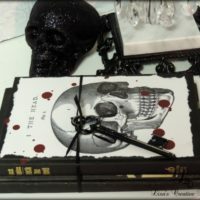 You can see how to create your own Spooky Bloody Finger Invitation Here . 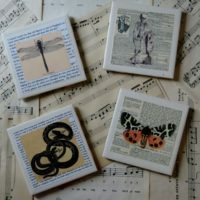 They definitely were a conversation piece! The next task at hand would be to set the mood. 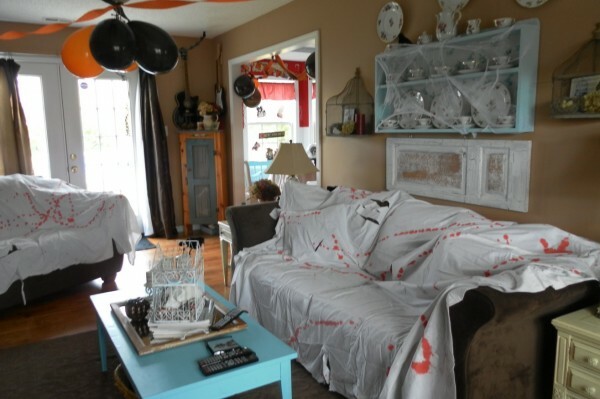 To get the look and feel of an authentic haunted house, rip holes in some old white (flat) bed sheets, splatter with some red paint for blood. 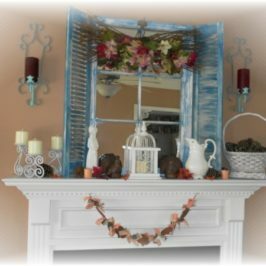 Drape them over couches, use them as curtains or table cloths. I picked up a few plain white bed sheets at my local thrift store for mere pennies. 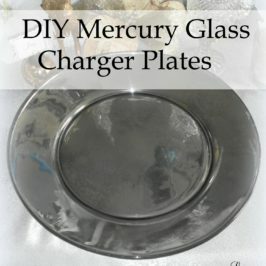 It’s inexpensive and really adds drama to the scene. These photos were taken in the daylight so they may not seem too sinister but at night, with the lights dim, they look great. 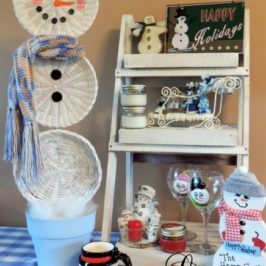 Dress up every day items instead of packing them away. 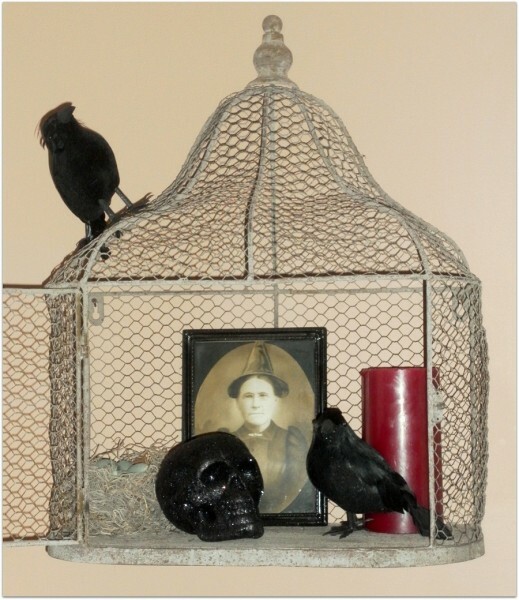 I have these birdcages hanging in my living room year round but when I added a skull, black crows and a creepy photograph it becomes spooktacular! 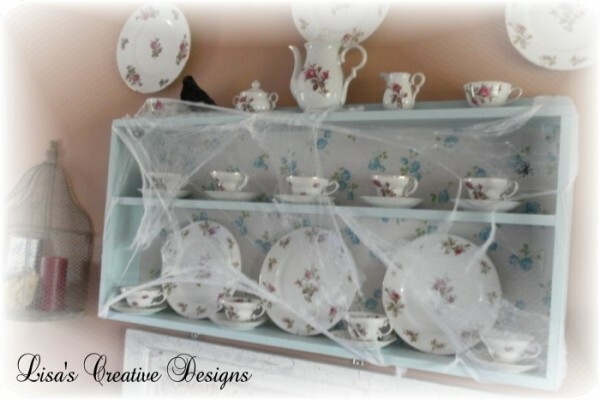 Even an everyday tea set can become part of a Halloween design scheme with the edition of cob webs and a blackbird. 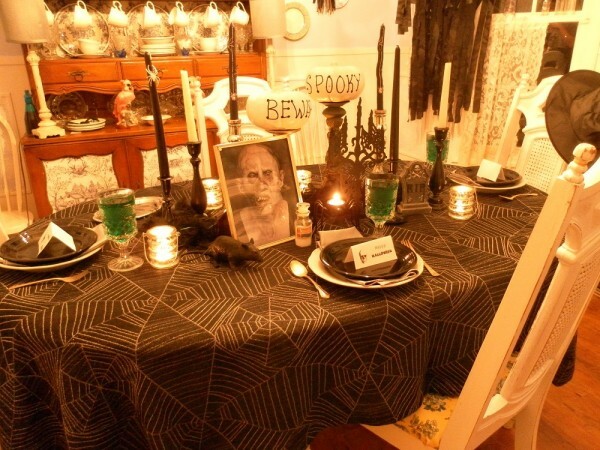 And what is a Halloween dinner party without a properly dressed dining room table????? 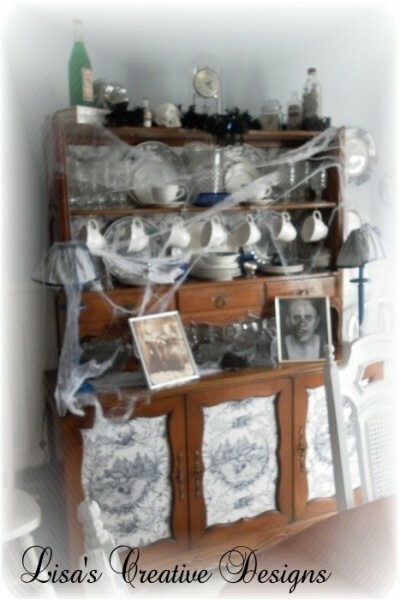 I began this table-scape with a black and silver spider web fabric tablecloth. 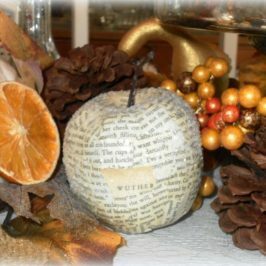 I added some candle sticks, tea-lights and mounted my white pumpkins to some chunky candle holders to add height to the table. 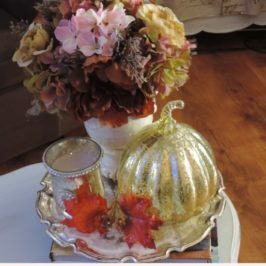 A few more accessories and this table-scape is ready to accept dinner guests. Don’t you just love the scary framed photo? Imagine him staring back at you while you are trying to eat! 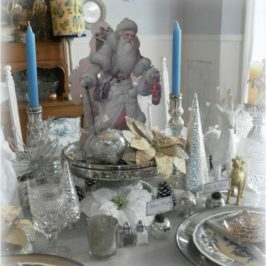 Each place setting was made up of a simple white plate, layered with a silver napkin and a black cake plate on top, along with vintage silverware and my favorite vintage glassware. 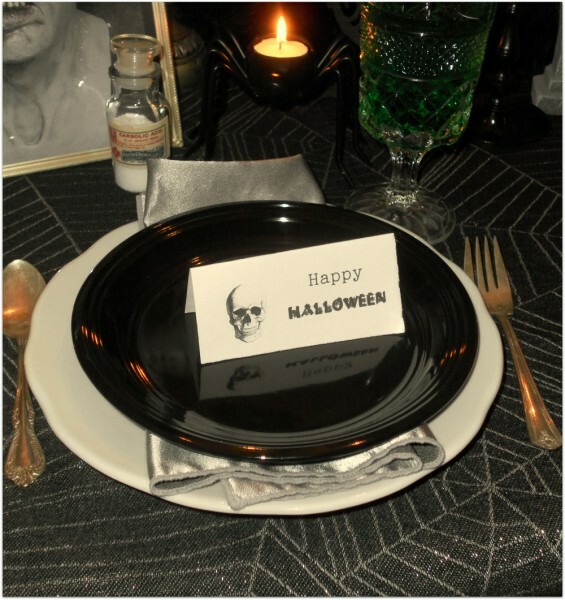 I printed up some Halloween place cards to place at each setting. You can easily create your own by using card stock, and a creepy font. Put your guests’ names on each one or a simple spooky greeting as I did. 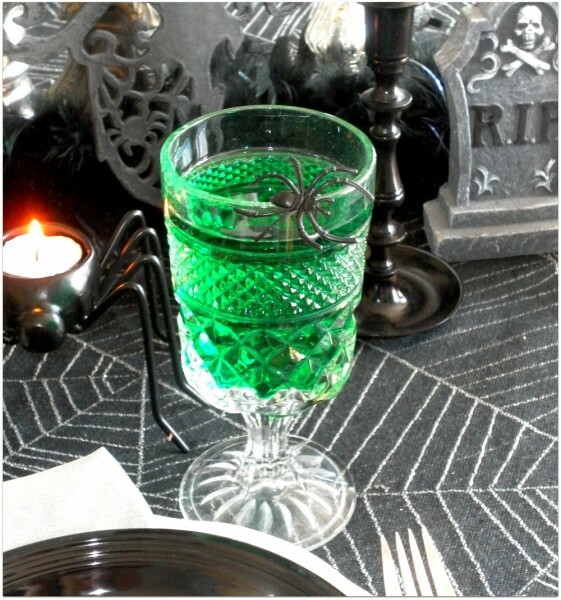 Serve green cocktails in vintage footed glasses topped with a plastic spider. And let’s not forget the lighting. Proper lighting is one of the most important factors in setting the tone for any dinner party. 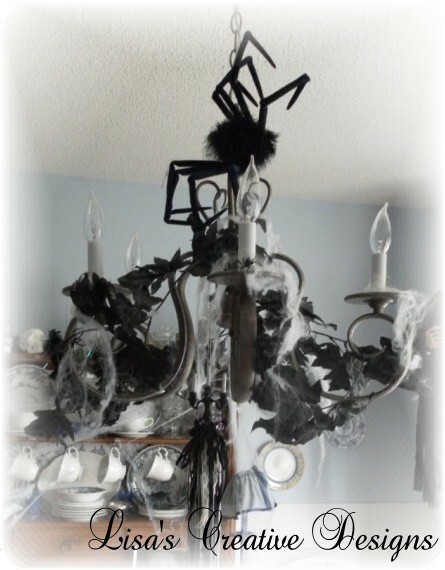 I dressed up the chandelier with a spider and webbing. I replaced each bulb with a flickering bulb I bought online. You can purchase these type of flickering bulbs here . They do not give off much light and the flickering effect really gives it the haunted house feel. With the edition of candlelight, this dining room becomes the perfect setting when the sun goes down. Don’t forget to decorate the rest of the room as well. 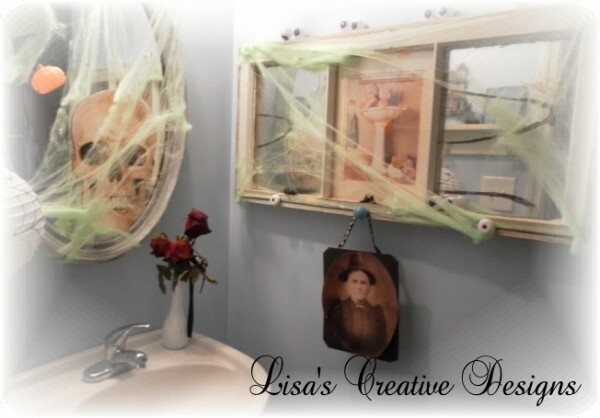 Spider webs add instant macabre while being inexpensive. 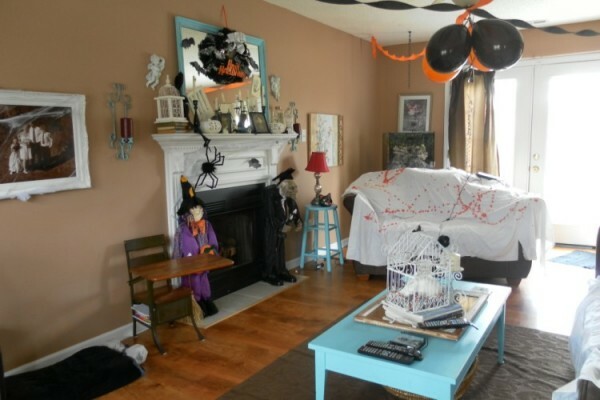 If you find that the spiderwebs are sticking to your hands while decorating, slip on a pair of latex gloves. The webs won’t stick to them. 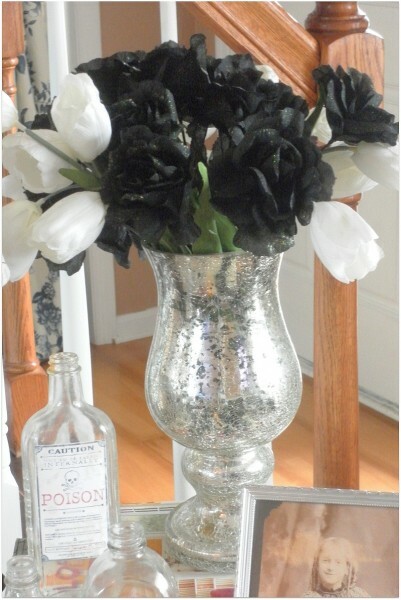 Some discarded glass bottles become Halloween Decor with the addition of vintage Halloween labels. 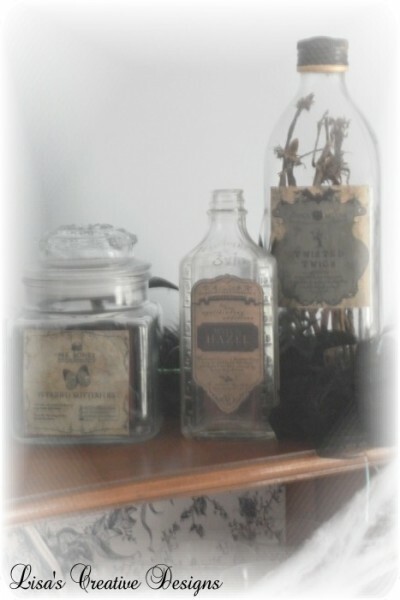 Fill the bottles with dead leaves, sticks, vampire teeth etc. Whatever the label depicts, try to drop something into the bottle that makes sense. For example, if the label says “poison” add green colored water to the bottle. Unless they are camels, your guests will more than likely be visiting your bathroom throughout the night. Of course that needs to be decorated too! Why not give them a surprise! I hung glow in the dark spider webs all over the place and replaced the light bulbs in the room with black lights. I also hung a string of purple and orange twinkle lights around the edge of the ceiling. It was so cool! I secured a few sets of plastic eyeballs around the room with some scotch tape. Talk about feeling watched in the dark! So, what kind of fare do you feed your dinner guests? 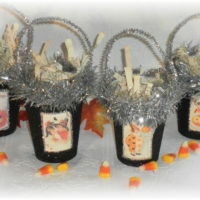 There are tons of recipes out there that will delight your Halloween dinner party goers. 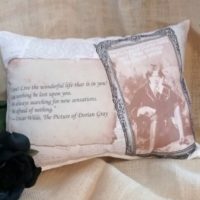 You can find some really grotesque recipes like Maggot Stew, Tasty Turds and Puking Pumpkins here at DivineDinnerParty.com . You might want to supply some barf bags too! 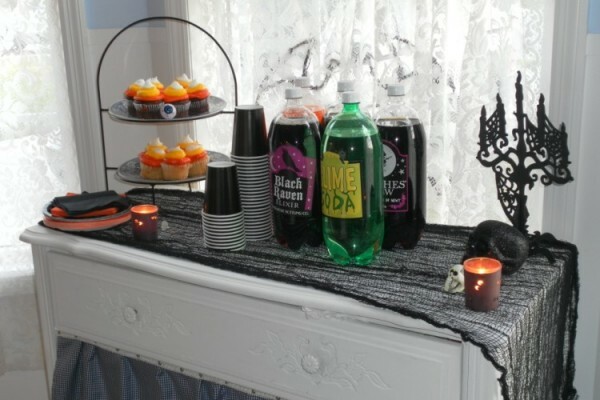 Store bought candy corn cupcakes and soda bottles wrapped in different “Poison” labels complete this refreshment table. My daughter and I had a great time making these delicious witch finger pretzels. 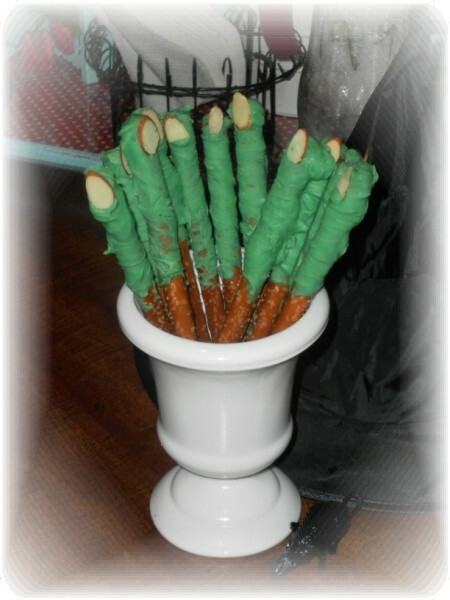 You can learn how to make these fabulous Wicked Witch Finger Pretzels here. 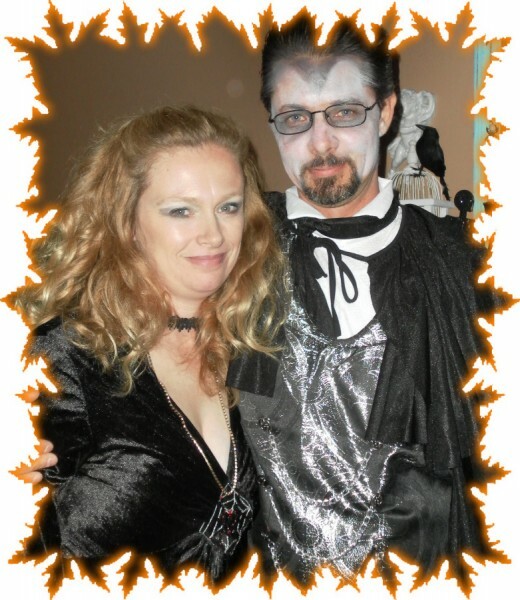 I have alot of fun decorating for Halloween. Boy what I could do with an old abandoned house! Now that would be a fun project! What a great place to have a party, real ghosts included! 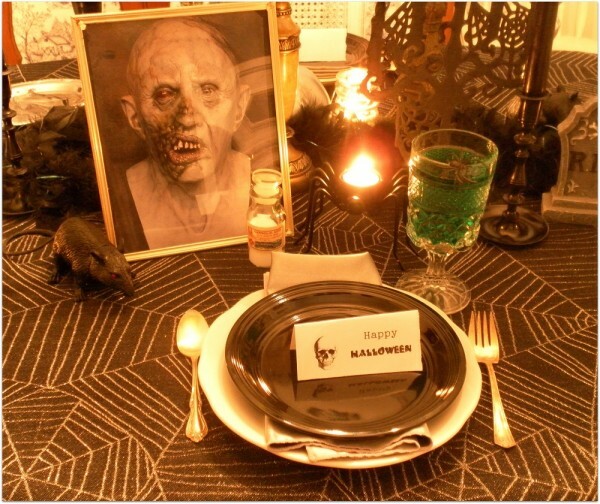 Now, get out there and start planning for your own creatively creepy Halloween dinner party! Very cool! You have created a totally fun atmosphere! 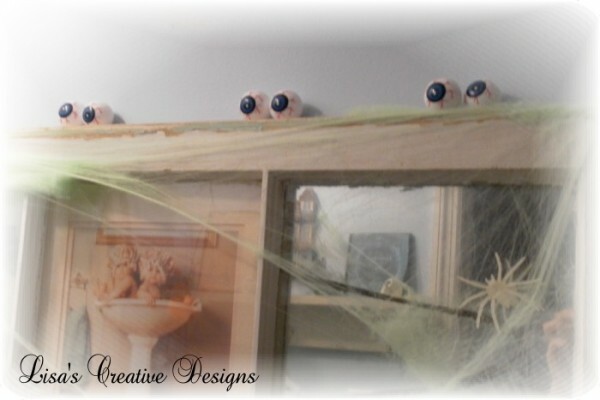 Love the bones, eyeballs and spiders webs! Love those crazy pretzels too! Great job!